Our farm is located in Tallarook, Victoria with approximately 100 acres of prime agricultural land. We started in 1989 with just three angora goats and increased numbers for fleece. When the Boer Goats were released from quarantine, we purchased a full blood buck to cross breed with our angoras and start to build our meat herd. Presently we can run up to 300 goats but as the demand increases we are always looking for others to supply us with quality boer or boer infused wethers. We purchase these wethers paying liveweight over the scales at our property in Tallarook. Suppliers are paid on the day of delivery. Animals must be NLIS tagged and come with a National Vendor Declaration. We also buy and sell Australia Boer Goats specifically for the goat meat industry. All our bucks and some of our does are Carcase Merit certified. This is a system adapted from the Sheep and Cattle industry to scan and grade animals for rib fat, rump fat, eye muscle area and intramuscular fat which are all hereditary traits. We are one of the only goat farms in Australia presently using this system. The outcome is to increase productivity and meat quality and give prospective buyers tangible objective and measurable information. We also sell pets – those kids which have been hand raised. Prime quality farmed goat meat carcases, prime cuts and smallgoods are sold direct to quality butchers and Melbourne based restaurants. When we started our business the demand was mainly concentrated on the export meat market as Australia is the world’s largest exporter of goat meat. However over the past 5 years with the increasing ethnic populations and a renewed interest in gourmet foods through media such as television cooking shows, we have seen a remarkable increase in domestic demand. Q: What inspired you to get involved in your industry? Tree change – when we moved to our rural property and making a decision about what do to with the land. Probably the wrong way to go about it but here we are 23 years later. Q: What have been the pitfalls you have overcome? How? Fencing – goats require good fencing, and over the years we have improved the existing fences and with the addition of good electrics we have resolved most of our issues but the goats still love to test our work. Shedding – unlike sheep and cattle, goats do require some type of shelter against heavy rain and wind chill factors. This has meant we needed to build some type of shelters for them in each paddock for certain times of the year. Drought – we instigated a planting program of fodder trees and formed an alliance with a local hay producer to try and ensure our feed requirements could be met. Water Supply – We increased the number of dams on our property as well as a semi reticulated water system. We endeavour to supply animals with fresh rain water where possible and the dams are a secondary source in times of drought and long dry periods. the goat industry as a real alternative to sheep and cattle. Proximity and demand to markets – the demand for goat has never been as strong as it is today and we have seen it increase dramatically over the past 5 years. So making sure where our markets were and how to service them was very important. Lack of available knowledge and mentoring skills – over the years we have seen agencies such as DPI loose knowledgeable people on goats so getting information has been difficult. Whilst the net is a good source it is not always reliable. Veterinarians also have not always had a good knowledge of goats but we are now seeing a lot of student vets taking an interest which only goes well for the future. We have spent the past two years working with Vet Students from Melbourne University giving them time with goats and helping them understand what is required and that goats are definitely different to sheep. We also attended NMIT courses specifically on goat and goat meat production to help enhance our knowledge – Certificates in Farming (Goat Production) and Advanced Certificate in Farming (Goat Production) – Specialising in Goat Meat and Fibre Production and Management. Q: What do you consider your successes? What do you attribute these to? 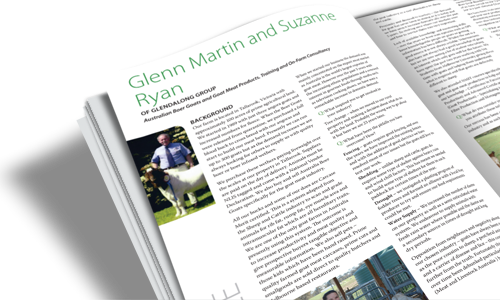 Our success has been a real passion for our industry and as such to help improve the focus of the goat industry through promotion and mentoring. Becoming heavily involved with the Boer Goat Breeders Association of Australia, both of us have served on the Victorian State Branch and Sue is a past National Chairman and Director. We have been instrumental in promoting goat meat and goat meat products and introducing it into discerning restaurants and quality butchers. We were also instrumental in having goat meat achieve recognition in the Delicious Produce Awards. Q: What are 5 tips you could give others in new rural industries? 1. Think about what you are going to do with your land before you buy it and make sure it is suitable for your chosen enterprise. Look at things like topography, water supply, fencing, shedding, local by-laws and/or regulations, access and egress of the property, neighbours, etc. 3. Make a business plan that can be changed easily if your circumstances change – think about your finance stream, labour resources, time resources. 4. Seek out competent people in your chosen industry to provide you with advice and mentoring – always ensure that the advice is relevant to your area, different areas and environments may impact differently. 5. Join an Association – associations can be a good source of information and support for your chosen industry being able to network with like-minded people can be very informative. Q: What is your future vision for your business? To be recognized as a prominent innovator, reliable and credible supplier in the live goat, goat meat and small-goods industry.